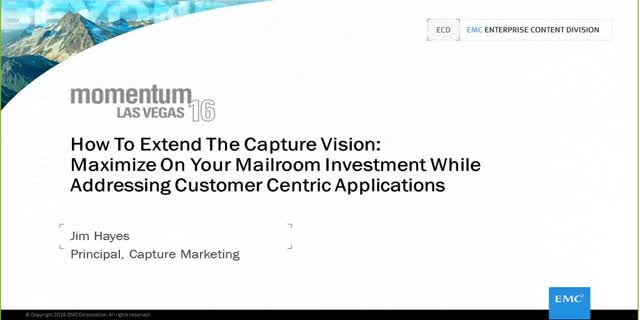 As mailroom capture deployments prove their value year over year, many organizations are now discussing how to maximize on those core investments in a number of ways. While most are strongly interested in leveraging automated classification and data extraction technologies to drive a stronger ROI, many are also extending the solution to remote locations, utilizing mobile capture and reaching out to handle capture requirements at the first point of customer contact. Learn as we explore how Captiva's Real Time Capture addresses these evolving requirements. Watch this EMC Webcast and learn how to build ECM applications with latest Documentum xCP. Documentum xCP is a platform for rapidly building and deploying content-centric applications that manage the entire lifecycle of enterprise information to help the user work faster and more efficiently. Bringing together document and data capture, ECM, BPM, search and analytics, collaboration, customer communications, and records management to give decision makers immediate access to relevant and reliable information. Join us for a session that focuses on EMC's Documentum as a Service offering. We will talk about the challenges customers face in managing Documentum, Captiva, Document Sciences and InfoArchive environments and demonstrate how Documentum as a Service can help reduce costs, improve stability and performance and enable IT departments to become more agile. Learn how effectively managing information is the key to your organization's successful digital transformation.